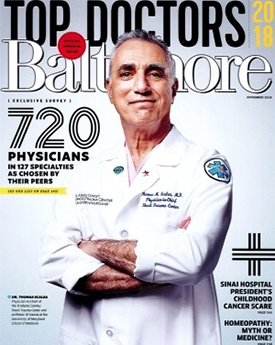 Baltimore Magazine Cover More than 70 doctors who provide care to patients at the University of Maryland Medical Center Downtown and Midtown Campuses have been recognized as "Top Doctors" in the November 2018 issue of Baltimore magazine. All of the recognized physicians are also faculty members of the University of Maryland School of Medicine. The recognition results are based on a Baltimore magazine survey of nearly 13,000 physicians in the Baltimore area, asking to whom they would send a member of their family in dozens of medical specialties. We are honored that many doctors would choose to send their loved ones to University of Maryland faculty physicians. To view our "top doctors," click here to visit www.umms.org/ummc.